For a 24-hour plumbing, air conditioning, and heating company in Linden, NJ call the experts at Rite Rate. When you have an emergency plumbing or HVAC issue, you can trust we’ll be there for you 24/7 all year long. Our plumbers and technicians are fully licensed and have years of experience in the field. Should you need a new sink, air conditioner replacement, or heating repair in Linden, NJ, contact Rite Rate. Our installation, repair, and replacement services are pocket-friendly for all budgets. Don’t wait to contact our team of professional technicians if you have a problem with your heating system. 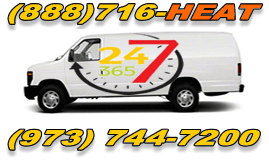 We can provide you with affordable heating repair 24/7 no matter the time or day. From boilers and furnaces to hot water heaters, you can trust our technicians will fix it and have it working efficiently in no time. Do you need a new heater installed but don’t know which to choose? Rite Rate can help you choose the right heater for your home or business and install it or replace your old one. Let Rite Rate be the heating company in Linden, NJ that can handle all your heating issues. You’ll never have to worry about heating repair, maintenance, replacement, or installation again! Do you need a central air conditioner installed? Is your commercial heat pump not working? Our air conditioning company covers installation, repair, replacement, and maintenance. Although maintenance can reduce the possibility of needing repairs, there may come a time when your AC is worn out and needs attention. Our technicians will be able to diagnose your AC system and determine if it needs repairs or a replacement. As for installations, we’ll be happy to assist you with choosing an efficient air conditioner for your home or business based on your preferences and budget. You can trust our air conditioning company in Linden, NJ can handle any make or model of residential and commercial air conditioners. Your home or business depends on a functional plumbing system but you can’t always avoid needing repairs, installations, or replacements. At Rite Rate, we provide customers with round the clock 24hr plumbing repairs and can install any pipe, drain, faucet, sink, shower and toilet! Don’t hesitate to call us if you need plumbing installations, repairs, or replacements!